This species is widespread (EOO at least 5214 km²) and not in danger of extinction. Bushmanland, Pofadder and Springbok to Kliprand. Calcrete outcrops or flats with quartz rubble. There are no known significant threats to this species. 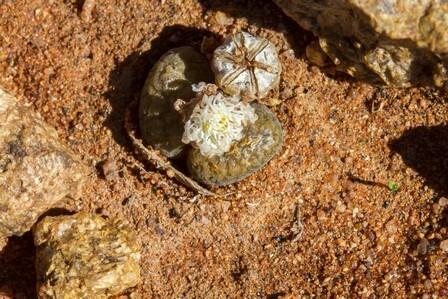 This species occurs in a remote and botanically still very poorly explored region of Bushmanland. It was thought to be rare, but recent field surveys indicate that it is probably much more common than what specimen records suggest. As there are probably still many undiscovered subpopulations, the population size is difficult to estimate. It is likely to be more than 1000 mature individuals, as subpopulations are large. It is not suspected to be declining. Rowley, G.D. 1978. Reunion of some genera of Mesembryanthemaceae. National Cactus and Succulent Journal 33(1):6-9.